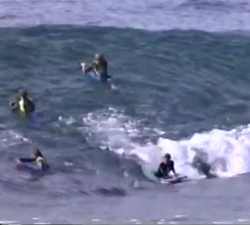 The resume of french DropKnee champion Fabien Thazar, tearing it up at home in Reunion. Edit: Ciel-Photographie. A short clip featuring Californian DK rider Dillon Fowler, filmed in one four hour session somewhere in Panama. Santa Slays with Edu Bartolomé!! MERRY #CHRISTMAS EVERYONE!!! Shot and edited by @avionetoo. Michael Syne mixing it up with Dropknee and prone around the South Coast of NSW. Brought to us by Daniel Baumann. Chilean National Dropknee Champion Leonardo Alar showing off his bag of tricks in 2017. Brought to us by Pasa Trae Company. Californian DK rider Dillon Fowler tearing it up in the Mentawai Islands and at home. From Fowler Films.